Japan is famous for its bullet trains. Even within Japan, they create a constant buzz among trainspotters (it's a serious hobby, believe us). We can understand the allure, of course, but have you ever thought about how much more you could see if you chose to travel on a slower, local train instead? We have, which is why we've compiled this list of interesting local lines to try, complete with extra ideas for sightseeing in the area. The modern graphics you’ll see at stations along this line in Ibaraki are unusual for a local train. They’re the result of a tie-up between railway operator Hitachinaka Seaside Railway and art project MMM (Minato Media Museum), which aims to improve the atmosphere of this under-populated area with modern art. The train runs through 14.3km of fields and tunnels, ending at Ajigaura Station, which is just a short walk from Ajigaura beach. It’s also close to Hitachi Seaside Park (en.hitachikaihin.jp), where you can catch the blooming of 4.5 million baby-blue Nemophila flowers in early May every year. From Choshi Station in Chiba, this train takes you to the eastern tip of the Kanto region, where you can enjoy a perfect view of the sunrise at Inubosaki Lighthouse. The railway nearly closed down after a decline in passengers, but since collaborating with a local soy-sauce factory to promote nure-senbei (soft rice crackers), profits are back up and the train is still going. Take a trip to Choshi fishing port for some fresh iwashi (sardines), one of the area’s best known delicacies, and don’t miss the majestic bluffs of Byobugaura, Japan’s answer to the white cliffs of Dover. Stretching almost 100km through the mountainous regions of Akita, Nairiku Jukan Railway is known for its special seasonal events. The ‘hotaru train’ in early summer takes you past swarms of fireflies (hotaru), while winter’s ‘Santa train’ comes filled with Christmas trees and decorations. Get off at Kakunodate and view the old samurai residences, or giggle at odd station names that only the locals can decipher (the kanji for Okashinai, for example, reads as ‘inner laugh’). 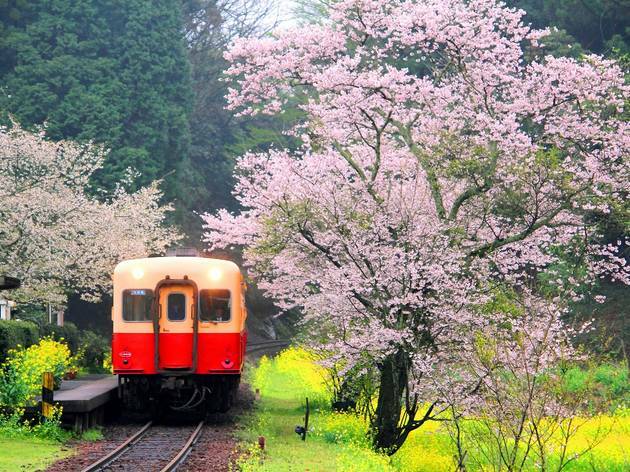 Well known for its distinct red and egg-yolk-yellow carriages, Kominato Railway makes a good day trip from Tokyo. Stop off at Yoro Keikoku Okukiyosumi Prefectural Natural Park, where you can hike and take an onsen, or at Kazusa-Okubo Station to greet your friendly neighbour Totoro (painted on the walls of the station). From late March to early May, be prepared for mobs of photographers standing along the tracks to capture the fields of striking yellow nanohana (rapeseed) blossoms. Travel along the coastline of the Sea of Japan and enjoy storytelling in Aomori’s Tsugaru dialect between Mutsu-Tsuruda and Kawabe stations, or listen to shamisen (three-stringed lute) performances between Ajigasawa and Goshogawara stations (on designated trains). 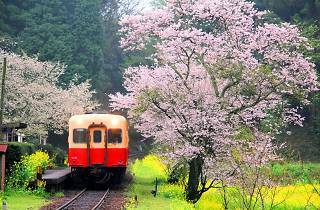 The railway provides easy access to the UNESCO World Heritage Site of Shirakami-Sanchi, a virgin beech forest where you can see the famous Aoike pond and its enchanting shades of green and blue.